Jim Hackett is president and chief executive officer, Ford Motor Company, effective May 22, 2017. He also is a member of the company’s board of directors. Under Hackett’s leadership, together with Bill Ford, Ford Motor Company is committed to becoming the world’s most trusted company, designing smart vehicles for a smart world that help people move more safely, confidently and freely. 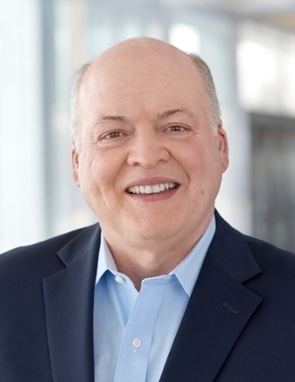 Prior to serving in this role, Hackett was named chairman of Ford Smart Mobility LLC in 2016, a subsidiary of Ford formed to accelerate the company’s plans to design, build, grow and invest in emerging mobility services. Before joining Ford Smart Mobility, he was a member of the Ford Motor Company Board of Directors from 2013-2016. Hackett was vice chairman of Steelcase, the global leader in the office furniture industry, from 2014 to 2015. He retired as CEO of Steelcase in February 2014, after having spent 20 years leading the Grand Rapids-based office furniture company. As a consumer-focused visionary in the office furniture industry, Hackett is credited with guiding Steelcase to becoming a global leader. During his 30 years there, he helped transform the office furniture company from traditional manufacturer to industry innovator. Having spent his career focused on the evolving needs of consumers, Hackett is recognized for predicting that the office landscape would shift away from cubicles to an open space environment, giving employees the flexibility to work where they want. He was interim director of athletics at the University of Michigan from October 31, 2014 to March 11, 2016 where he led the search for a permanent athletic director appointed in January 2016. He played center on the University of Michigan football team prior to graduating from the university with a bachelor’s degree in 1977. 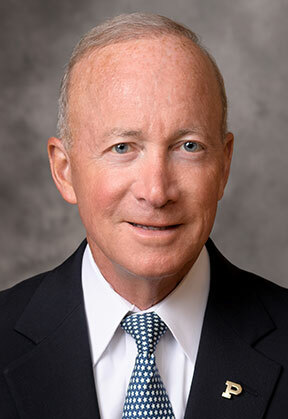 Mitchell E. Daniels, Jr. is the 12th president of Purdue University and the former governor of Indiana. He was elected Indiana’s 49th governor in 2004 in his first bid for any elected office, and then re-elected in 2008 with more votes than any governor in the state's history. During his tenure, Indiana went from bankruptcy to a AAA credit rating, led the nation in infrastructure building, and passed sweeping ethics and healthcare reforms. After a series of transformations, which included the biggest tax cut in state history, the nation’s most sweeping deregulation of the telecommunications industry and a host of other reforms aimed at strengthening the state’s economy, Indiana’s business climate is now rated among the nation’s best. At Purdue, Daniels has prioritized student affordability and reinvestment in the university’s strengths. Breaking with a 36-year trend, Purdue has held tuition unchanged from 2012 through at least the 2019-20 academic year. Simultaneously, room rates have remained steady, meal plan rates have fallen 10 percent, and student borrowing has dropped 31 percent while investments in student success and STEM research have undergone unprecedented growth. It is less expensive to attend Purdue today than it was in 2012, even without adjusting for inflation.